Today’s recipe comes from a very trusted source…my sister, Nila Barros of Kansas City, Missouri. She is a world class cookie baker and blesses many in her church family with hundreds of perfectly delicious cookies every year. 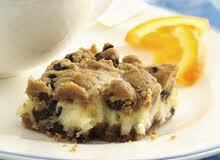 This is a very easy and delicous bar if you need a dessert in a hurry! Thank you Nila! Preheat oven to 375. Pat out half of the cookie dough into a 9 x 13 pan. Mix cream cheese, egg and sugar until smooth; spread over cookie dough. Top with remaining cookie dough. Bake about 20 minutes or until toothpick comes out clean. *Note: Nila usually makes her own cookie dough using mini chocolate chips instead of standard size and it turns out great! PS This recipe is included in our “Between Friends” Cookbook on page 376.